The Limpopo master had a great 2013 and an even better 2014. 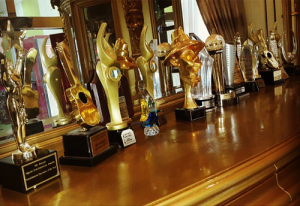 Acquiring about 4 new expensive luxury vehicles this year, he also walked away with a couple music awards. KCee has encouraged his followers to always believe first if they intend to succeed. He posted the photo above showing all his awards to show it has been a good year.